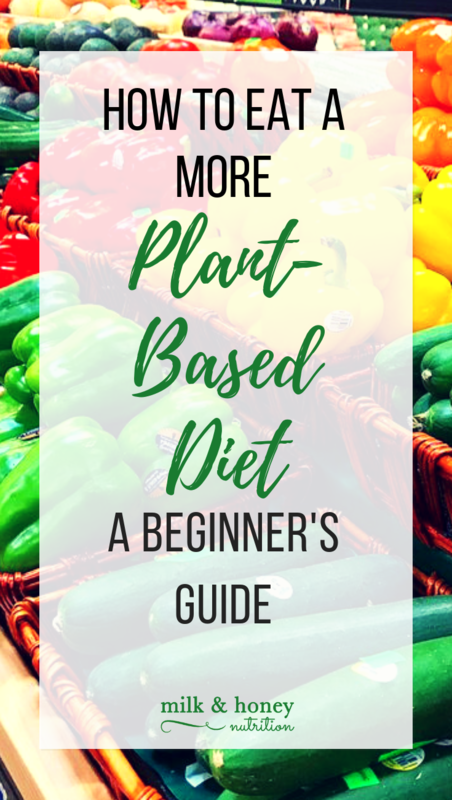 This post about How to eat a more plant-based diet: A beginner's guide was sponsored by Sprouts Farmers Market. All thoughts and ideas are my own. I'm not a vegan or vegetarian... but I definitely appreciate a good plant based meal and think everyone could benefit from learning how to eat a more plant-based diet. Why? Honestly, plant based meals tend to be cheaper, better for the environment, and we don't HAVE to eat meat everyday. Plant based protein for some people can be less inflammatory than animal protein and tends to offer more anti-inflammatory fats along with it than animal protein. "To me it means eating mostly plants- veggies, fruits, nuts, seeds, legumes, grains- but not necessarily a strict vegan or vegetarian"
The beauty of the "plant based" movement is you can make it what you want. If you're not ready to go completely vegetarian (or if you just don't want to), that's totally fine... maybe incorporating meatless Monday meals is a good option? Or committing to eating vegetables at every meal for 2-3 days. One of the many things I love about Sprouts Farmer's Market is how they help foster the idea that all foods fit, and make healthy eating (however you define that) more affordable for everyone. Not only do they have some of the cheapest produce prices I've ever seen, they also offer an amazing in house brand (Sprouts Brand) filled with plant based options. The Organic Coconut Cream is one of my favorite products! Makes a great sub for sweetened condensed milk in baked goods and other recipes! What better way to learn how to do something than from the experts?! Keep reading for some tips from some of my favorite dietitian and healthy living experts! “If you start purchasing meat alternatives, be sure they contain adequate protein while providing some nutrients comparable to what you'd obtain from meat. Many "veggie burgers" or plant-based freezer foods contain next to no protein, and are very rich in fat and fillers. These can be fine every once in a while, but protein is crucial to feel satiated from meals as well as for many body functions. “Start where you are and with what you know. Take a list of favorite meals and make simple substitutions to create plant-based versions of them, and experiment until you find one you love! Plant-based living will soon become second nature. “Grains tend to be more time-consuming to cook, so I love to make a batch on Sunday and repurpose them in different dishes throughout the week. This way I’m not waiting for them to cook each night! -Samara Abbott, G&G Nutrition Co.
“For 2 weeks try to have a serving vegetables with every meal. This exercise does two things, first it gets you in the habit of always planning on buying and prepping veggies. Second, it helps turn veggies into the main course and your protein and starches the sides. If you stick to developing the habit, eventually you’ll find a meal isn’t a meal unless there’s veggies!